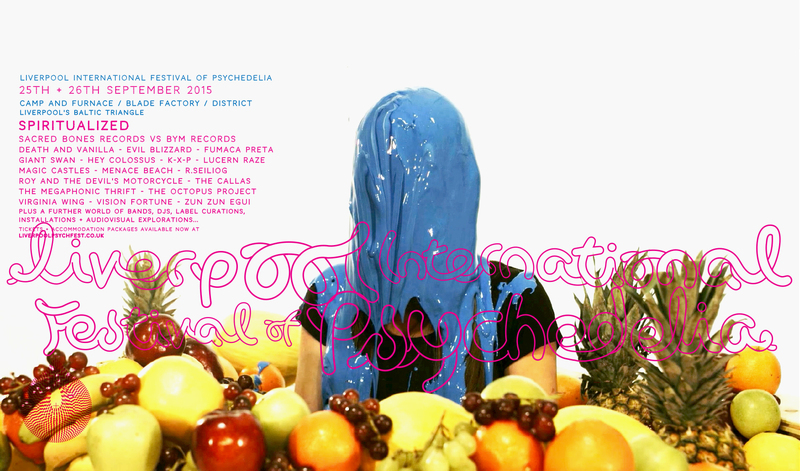 Spiritualized have just been announced as the first headline act for Liverpool International Festival of Psychedelia 2015. Now in its fourth year, and further buoyed by its wonderful success at last week’s NME Awards ceremony where it was named ‘Best Small Festival’, this spectacular two day event will once more be celebrating everything that is great about the psychedelic sub-culture as it returns to the scene of last year’s triumph in the Camp and Furnace, Blade Factory and District warehouse spaces set deep in the heart of the city’s creative Baltic Triangle. Having now spent almost quarter of a century in the very vanguard of space-rock exploration, Spiritualized’s appearance fits perfectly with the festival’s ethos of presenting groundbreaking acts and an extensive supporting programme of visual arts, film and psychedelic curations. Last year it was Sonic Cathedral who firmly took the reins on one such curation on the main stage; this year it will be the turn of two other revered labels, Brooklyn’s Sacred Bones Records and Chile’s Bym Records who will be presenting a magnificent raft of acts from their respective rosters. Available from www.LiverpoolPsychFest.com instore at Probe Records (Liverpool) / Piccadilly Records (Manchester) / Jumbo Records (Leeds).